Annual reports are not (typically) all that compelling. They're informative, sure, but they're also tough to read and even tougher to fill with content. 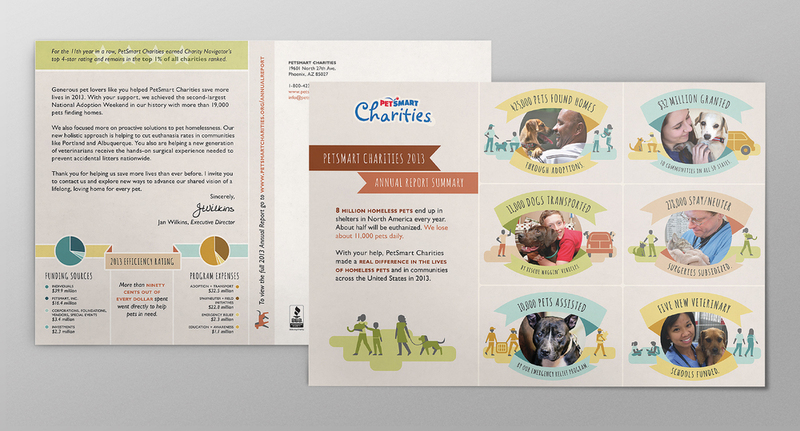 That's why I was especially excited when PetSmart Charities wanted to break with non-profit tradition and try a new format for their FY2013 annual report: a digital infographic with companion post cards. This project began with just a selection of photos and a list of figures — a nearly-blank slate! The fun regional illustrations I created for the final piece not only make it a more engaging read in general, but help any reader connect the facts and figures presented back to their own communities. Check out the sketchbook to see the original sketches.